Looks similar to real money at first glance. We’ve all walked into the club and just tossed all sorts of money in the air, because, let’s face it, we all have way too much money to spend it all by ourselves, right? Yeah, no that’s not us either. Usually after we check our bank account, we try to dry our tears on the dish towel we got from our parents before we left for college, and should have replaced a long time ago. We all still dream about making it rain at least once in our lives though, right? Well we might have found a solution. 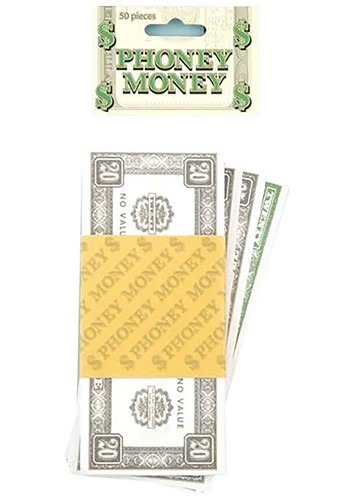 Just grab a bunch of this fake money. It’s much cheaper than the original so it will make even the poorest of us feel like a high roller when they’re in the club tossing fistfuls of it into the crowd. Not convinced it’s the same thing? Imagine being out on the ski slopes. Sometimes it doesn’t snow quite enough for the experience to be great, so the workers are required to make artificial snow to fill in the gaps. Snow is basically rain, and we call money rain when we toss it in the air. Therefore, per science, it’s the same thing. Just don’t try convincing the waiter of that when your bill comes.